Abbvie is retaliating hard against the firms, which are marketing Humira’s biosimilar products and increasing their market shares in Europe armed with competitive prices, by providing steep discounts. Humira is one of the world’s most purchased biomedicine with an estimated 18 trillion won ($15 billion) in annual sales and is Abbvie’s top earner, accounting for about 60 percent of its net revenue. It has applications for rheumatoid arthritis, juvenile idiopathic arthritis, axial spondyloarthritis, psoriatic arthritis, psoriasis, pediatric plaque psoriasis, adult and adolescent hidradenitis suppurativa, Crohn’s disease, pediatric Crohn’s disease, ulcerative colitis and uveitis. With the recent launches of cheaper biosimilars, such as Samsung Bioepis’ Imraldi, Amgen’s Amgevita, Sandoz’s Hyrimoz, and Mylan’s Hulio, the company has confronted fierce competition outside the United States. Biogen, Samsung Bioepis’ marketing partner of Imraldi in Europe, reported a massive success in its earnings in the fourth quarter of last year. 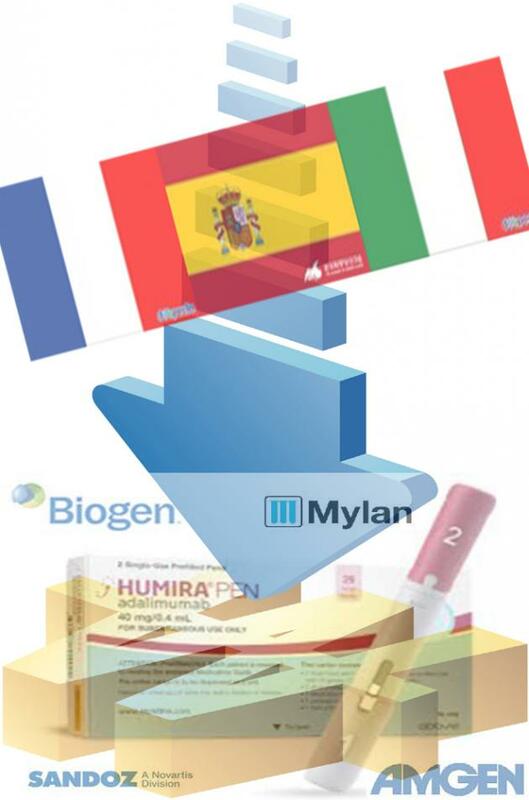 biosimilars, such as Biogen, Amgen and Sandoz, out of the European market. The new competition has led Abbvie to lower its non-U.S. sales estimates for Humira in 2019 to 30 percent earlier this year. In November last year, the company forecast a 26-27 percent decline for non-U.S. Humira sales in 2019. With the inevitable decrease in sales, the company has taken up a new business approach to preserving its monopoly on Humira in Europe by giving steep discounts to match competitive prices provided by its competitors providing biosimilars. The aggressive approach has seen quick results in Europe, according to an industry watcher. It was the first time biosimilars have failed in Norway, he added. Arias also stressed that such phenomena are happening all over Europe as other countries, including France, Spain, and Italy, are also seeing tepid responses to biosimilars. A similar situation is going on in the Netherlands where Abbvie is discounting Humira by as much as 89 percent to keep its shares. According to De Groene Amsterdammer, a Dutch news outlet, Abbvie has been fighting an unprecedentedly fierce battle to preserve the monopoly on Humira. As a result, at least 70 percent of Dutch patients continue to be treated with Humira, it added. Now, the Netherlands is worrying about the possible aftermath if Abbvie's discounting drives biosimilar makers out of the market. A local expert has gone even further to claim that Abbvie could raise prices again after the other biosimilars leave the market. The Dutch news outlet also reported that another way in which Abbvie is trying to maintain its market share is to shift its focus to what insiders call the residual financial risk. However, AbbVie has told hospitals that it will provide discounts only when at least 80 percent of patients continue to use Humira. “Such actions make it hardly worthwhile to transfer the rest of the patients to Humira biosimilars, which focus on price competitiveness,” the paper said. According to De Groene Amsterdammer, the Dutch competition authorities have started to take a closer look into the procurement process for Humira. Regarding its raging price battle, Abbvie said that it would not respond to the various claims and speculations that have led to an inquiry made from De Groene Amsterdammer. "As usual, what happens at the negotiating table is confidential," a company official said. “The company believes that patients will continue to have access to Humira as a treatment option and doctors will continue to have the choice to prescribe it." With Abbvie taking the next step to secure its market share, many are paying attention to what the biosimilar companies will do to retain their shares. One expert said biosimilar companies might not be able to match the steep discount provided by Abbvie. The objective is to defend the U.S. market by denying the biosimilars in-market experience in Europe and then arguing the Europeans chose Humira over the biosimilars for quality reasons beyond price, Gal said, adding that biosimilar companies will have to recoup their R&D investments, and so they will not be able to match AbbVie’s low tender price. Biosimilar companies, including Biogen, said that they would monitor the situation closely and react according to Abbvie’s aggressive marketing strategy. The spokesperson stressed that Biogen is pursuing the following three goals -- establish Biogen as the preferred biosimilar solutions partner, continue to switching patients, and expand customer pool, and accelerate access.